E-Commerce Single Page Application (SPA) can be created very easily thanks to Frontastic. Because Frontastic is a React JS Platform as a Service. And React is already half the way to a single page application. One after the other: What is E-Commerce Single Page Application all about? To make it very simple: The aim is to create a shopping experience that is as good as the big Zalando or About You platforms. On the smartphone in particular, it is noticeable that these websites actually behave like apps. Essentially, it means that the shopping experience is not interrupted by constant page reloads, but only the parts that are currently needed are loaded. Modern e-commerce single page applications dynamically reload content by clicking or scrolling. Simply put, it does not load a new HTML page, but only the required text or graphics. 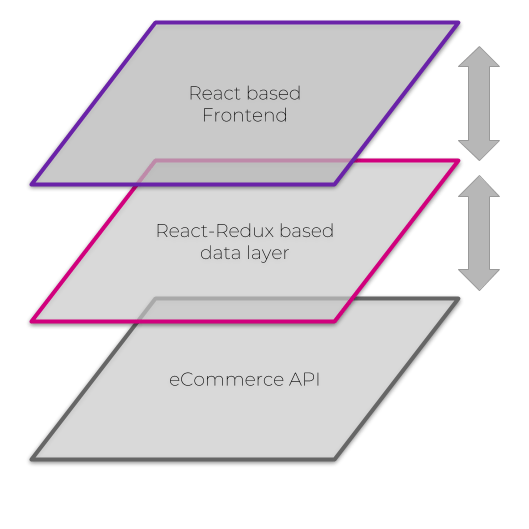 The frontend communicates primarily with the Redux data layer, which is also kept in the browser. In this way, the required parts of the page are simply reloaded dynamically. The data layer in turn communicates with the e-commerce API and can probably load required information into the browser in the background. So the customer never has to wait unnecessarily for the page. The e-commerce systems used today are mostly monolithic (i.e. frontend and backend are delivered in one piece). That in itself is not a problem. Today, however, no manufacturer has converted its frontend to a modern single page application. And since these are monoliths – software from a single piece – one cannot “just like that” place a new frontend in front of it. Unless there is a comprehensive programming interface (API) – but more about that. The customer naturally expects the same shopping experience as with Zalando, About You & Co. But the previous e-commerce systems “off the peg” could not offer this. Modern e-commerce or content management systems are today produced “headless” or API-first. I.e. they come without the (mostly outdated) frontend. Frontend programmers can then (with great effort) program a single page application against the API of modern e-commerce. As already indicated, the effort for this solution is usually very high. Since it is not a standard frontend, the user interface used by the content editors is usually very rudimentary and the online teams are often unable to act without the support of the frontend programmers. It has factory integrations for API-based systems such as Commercetools, About You Cloud, Shopify Plus, Contentful, etc. It offers a very easy to use user interface for the Contend Editors and Online Teams, which was designed for use in the enterprise segment. Online teams can work largely independently of the Frontend Developer and drive their topics forward. The effort for an e-commerce project is reduced dramatically. Frontastic is a complete platform including hosting. Through the combination of Frontastic and a modern, API-based e-commerce system, it is finally possible to offer an outstanding customer experience – and all this with a very manageable effort! How does this Single Page Application Framework “as a Service” work? The E-Commerce Single Page Application, which ultimately inspires the customer, consists of many small components, the so-called “Tastics”. When a customer clicks on an element, it dynamically loads the required data or images to it. Frontastic takes over the communication with the e-commerce system (e.g. for product data). Frontastic already supplies many of these components as standard, which only have to be adapted to individual requirements. The actual e-commerce logic takes place in the e-commerce system. Frontastic communicates with it via the programming interfaces (API). The Online Editor can design all pages – from the homepage, to category pages, to the shopping cart and checkout via the Tastics. I.e. it can compile and configure the elements via drag & drop. The best: he can check all his changes live on the smartphones, tablets or TV screens that are relevant for his customers. This is made possible by a special technology that communicates directly with the end devices. For example, a real “mobile-first” development is possible. Simply create an E-Commerce Single Page Application! Thanks to Frontastic, companies can easily create a new e-commerce application that behaves like an app. New business ideas can be tested with very little development effort and successful ideas can be scaled arbitrarily, because Frontastic as a platform as a service also takes care of the autoscaling of web applications. My experience is: just try it out! Seriously, we ourselves are often a little “scared” how fast the first prototype is implemented. Ready to develop your own single page application based on Frontastic? You can now try the React Framework as a Service. From now on we accept registrations for the Developer Preview. After we have activated your account, you will get a git repository from which you can build your VM/Docker containers and start immediately. Please use your job email address (not gmail.com, live.com, …). To make our conversation a little more personal. We create a repository on Github for you. We store your name, email address and message in our CRM ProsperWorks to ensure timely and reliable processing. Without your consent, we will not use your e-mail address for newsletters or the like, but to answer your request. Of course, we will also delete your data if you wish. Just let us know! If you select this checkbox, we will send you regular news. Of course you can unsubscribe at any time via the link in the newsletter. We save your name and e-mail address to send you regular news. For this we use like many the service Mailchimp, to which we give your data. Of course you can unsubscribe from the newsletter at any time via the link at the end of the newsletter. Send us a message – we’ll get back to you immediately! Do you like our articles? Then simply subscribe to our newsletter. We won’t fill you with advertising, I promise!